You will need your Kindle address for almost all services. You will find it on your Kindle management page. In your ‘Send-to-Kindle E-Mail Settings’ you will see all your devices with the corresponding e-Mail address. Scroll down to the last section and add a new e-Mail to your allowed addresses. Tip: It is also possible to use wildcard addresses like ‘@joschika.tk’ – so all mails from joschika.tk will be forwarded to your Kindle. This service is one of my favourites because it includes images – although it’s not entirely free. To use periodicals you have to register yourself. The basic membership is free and I never got any spam mails. 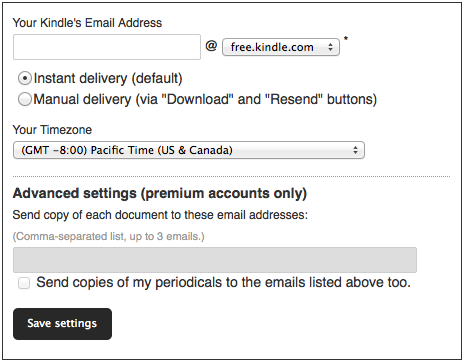 After you created your account, head over to ‘Settings’ and add your Kindle mail address to your SendToReader account. Enter your kindle address – like firstname.lastname@kindle.com – and choose your timezone. Tip: If you have a Kindle WiFi choose kindle.com. If you have a Kindle 3G, be sure to choose WiFi (free.kindle.com) or 3G delivery (kindle.com). If you choose 3G delivery Amazon may charge you extra fees. Don’t forget to add the SendToReader address ‘kindle@sendtoreader.com’ to your allowed Kindle personal document addresses. See the corresponding part at the beginning of this post. Now go to ‘My Periodicals’ and click on the add option. Copy and paste your RSS-Feed urls into this box and give it a proper name. The time you choose for the delivery, will be in your timezone (which you set in ‘Settings’). You can expect the first delivery of your periodical one day after you added it to your list – but only if you are a premium subscriber. This service is very easy to use, but very limited with a free account. It is only possible to add up to 12 feeds and you won’t get scheduled delivery without a paid submission. The conversion to books will only use the feed content, and not the articles linked to feed entries. It is possible to link kindlefeeder with Instagram to download full articles (but only one article at once). You have to create a free account and then update your settings. Be careful, because here you have to add your Kindle username, and not your Kindle address. The username is the part before the ‘@’ in your Kindle address. Don’t forget to add the ‘@kindlefeeder.com’ to your allowed Kindle personal document addresses. See the corresponding part at the beginning of this post. 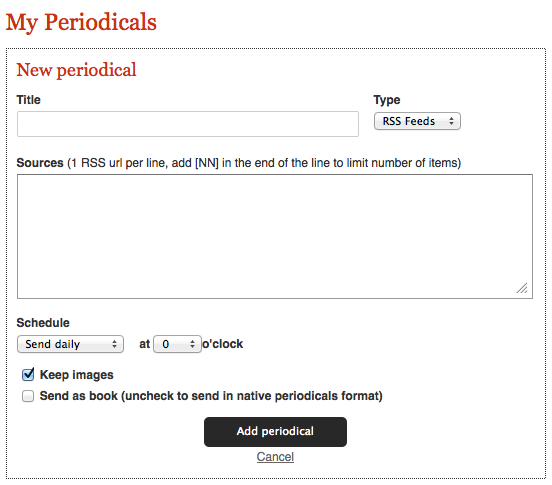 To add feeds to your Periodical, use the ‘add feeds’ feature. There are a couple of good feeds already available and you can add your own feed urls. As already mentioned it is only possible to add 12 feeds as a free user. On your dashboard you can send your feed items to your Kindle or your e-Mail address. Just click the button with the desired destination. To schedule the automated delivery of your feeds you have to go for a premium account. Premium accounts are 20$ for one year – so that’s quite cheap. Be sure to check out all the available settings, there are many customization options for your feed-periodical. I think this is the easiest way to get a periodical of a feed but you can only use it with Google Reader. Choose the online version “Get your Google Reader news as an eBook immediately” (or click on the link). 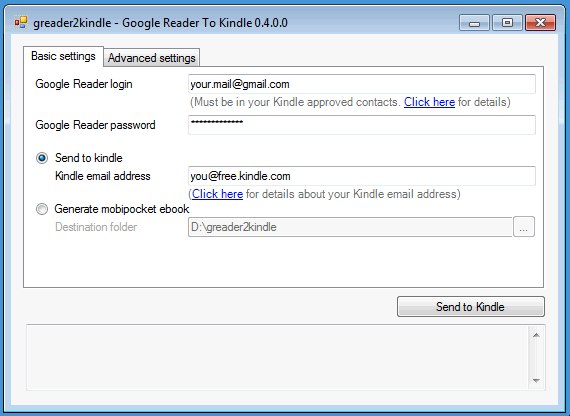 It will open a new window where Greader2Kindle will ask you for access to your Google Reader account. After you granted access to your account you will see the settings page (and that’s already everything of the service). I would recommend checking all the boxes – then you will get only unread articles, every item that is exported to your periodical will be marked as read and you will get pictures and even the referenced webpages of an article into your periodical. Be sure to choose a appropriate amount of articles to export, don’t use 500 if you only have feeds with 20 articles per day. You can enter any e-Mail address you want, but if you want automatically delivery to your kindle enter your kindle address. Then choose a schedule to send your articles to you. I don’t know in which timezone the time is – please let me know in the comments if you find out. If you want your book now, and don’t want to wait for the automatic delivery, click save and email me my eBook. The server isn’t the fastest, so be patient. 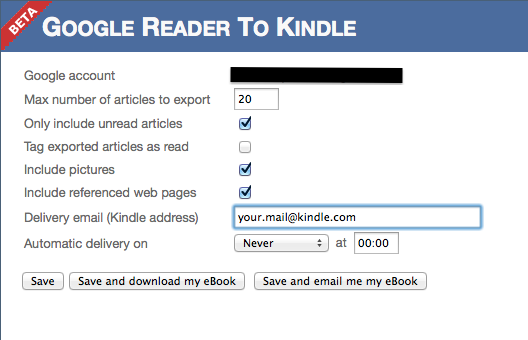 Don’t forget to add your Gmail address to your allowed Kindle personal document addresses. See the corresponding part at the beginning of this post. You can also download Greader2Kindle as a Windows application. It offers almost the same possibilities as the online Greader2Kindle. The offline version offers the additional possibility to send the periodical with another e-Mail than your Gmail address. Install the windows application (still in a very early stage). You will see this window if you open the application. 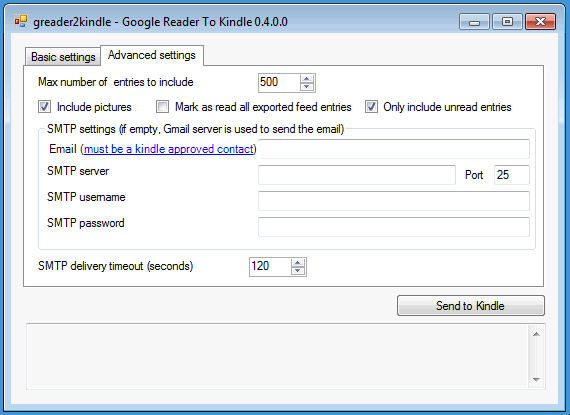 Enter your Google Reader credentials and your Kindle address. Customize the settings and leave the e-Mail settings empty if you want to use your Gmail address. As always: Don’t forget to add your Gmail address (or the address you specified in advanced settings) to your allowed Kindle personal document addresses. See the corresponding part at the beginning of this post. I recommend this method – I covered this in an own post!